리우데자네이루 코파카바나 / 레미에 위치한 호텔 아스토리아 코파카바나은 여행객들에게 최고 인기있는 곳입니다. 이곳에서 생생한 도시의 모든것을 쉽게 즐기실 수 있습니다. 지역의 관광 명소와 경치를 구경하고, 호텔에서 멀지 않은 코파카바나 비치, 카사 드 단카 칼린호스 드 지저스, 파스마도 오버룩에서 즐거운 시간을 보낼 수 있습니다. 호텔 아스토리아 코파카바나에서 훌륭한 서비스와 우수한 시설이 잊을 수 없는 여행이 될겁니다. 이 환상적인 호텔에서 여러분은 24시간 프런트 데스크, 장애인용 편의시설, 여행 가방 보관, 발렛 파킹, 룸 서비스 등을 즐기실 수 있습니다. 모든 숙박시설에는 생활 편의시설이 마련되어 있어 더할나위 없이 편하게 보내실 수 있습니다. 헬스장, 사우나, 실외 수영장 등을 포함하여 완벽한 여가시설이 구비되어 있는 호텔입니다. 즐거움을 주는 비교할 수 없는 서비스와 진정한 일류를 제공하는 호텔 아스토리아 코파카바나. Average hotel. offerdable place to stay for a week end closed to the happening areas. A lot of bad reviews about front of desk staff not being helpful etc. Did not speak to the guys later at night but the girl in the evening was very helpful and very smiley. Other than one of two lifts being out of order it was all good. AC sounded like a jet was landing outside but it was prob the coolest AC I have had in Brazil. 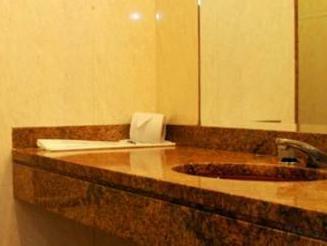 Location is very good, can reach Copacabana 2~3minutes by walk. Room was small but clean and not convenient to stay. Recommend for someone travel alone. Very bad. The room was ultra small like a dorm room despite me paying a good deal for it. unfriendly staff, room was converted broom cupboard.. too small for a small-sized suitcase to be open unless it was on the old single bed. over charged with hidden extras. Okay,nothing spectacular but for the time and location worth the price. Room was small but you don't spend time in it anyway. Inside the room, there is a single bed, and a wobbly wooden plank that protrudes from the wall which functions as a desk. As the screws of this plank were so loose, putting stuff on it would make the plank tilt. There is no space to put the suitcase, so I had to put it in front of the toilet door, blocking my access to the toilet. There is a safe in the room but the safe has NO DOOR!!! As there is no natural light in both the room or the bathroom (the windows open into a well and it is only about a feet away from the adjacent building), so you cannot tell whether it is day or night even if the curtains are wide open. There are many moths in the bathroom, there was once I switched on the tap of the sink, and four moths came flying out of the tap! There is housekeeping every day, but I find hairs on the floor which is certainly not mine, and they are not cleaned up after days. There is a 100 square feet room called a gym. The control panel of the biking machine fell off to the ground when I pressed the on button! Its just 2 blocks away from Copacabana beach. Hotel room was very very small. If you have more luggage then its difficult to manage. I forgotten some stuffs in hotel, but initially they said yes they got it but after that they simply denied it. i would not recommend my enemy to stay at this hotel. For the price this is hotel is charging does not tally up. This hotel is under construction, it's dangerous structure. On every floors they had massive holes dug in to pass the wiring. Work starts at 8am till 5pm, so no chance for a nap or a relaxation. Breakfast time is surrounded by dust. Reception areas ceiling collapsed one morning. The rooms are very small, if you are a tall person like me then your feet will sick out the bed. Good service and nice, helpfull staff. the location is good in Copacabana both for business and fun. Comfortable small rooms. No views . Clean beds but very small rooms. 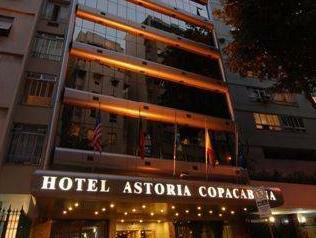 The hotel is located very close to the beach, restauarants and bars in copacabana. The breakfast buffet menu has a great selection and the food is delicious. The people that work there are nice. Most of the times, you will see the personnel talking between each other, while you are waiting too ask something at the reception and they won't pay attention to you. However, you get what you ask for at the end. The rooms are very small and only one person at the reception speaks english. Close to the beach. Good breakfast. Friendly staff and very helpful with setting up and finding tourist attractions. Nice bathrooms. Beds were a little small and not that comfortable. a guy named Franklin he is the best! he's the only good part in this hotel. oh, and leaving! the hotel charges for everything! and a lot! the Internet was 20R per a day and only able to use down stairs, it 2009 get with the program! gets better i was frustrated so i bought a drink- they charged me for each ingredient separately. so again 20R. We had a red eye flight and arrived late. so my husband was sleeping i made him a plate of fruit and attempted to bring it up to him, the hotel morning staff is really nasty and said they are charging me for bringing food up to my room. Besides the morning staff as i said are rude, and dont speak a good english. Franklin is there in the eve, hes great. I switched to a hostel which is a lot better! I got free Internet and best of all the staff was incredible! Clean. Great shower. Not much noise, which was a concern because we were staying in Copacabana. Full breakfast was solid. Front desk people will try to sell you tours - ignore them. Will also try to get you overpriced cabbies, just pretend like you aren't interested and they will negotiate down to reasonable prices. Had to push two single beds together to make one bed (I went with my girlfriend); this isn't uncommon in brazil so if its a big concern make sure to contact ahead of time and request one larger bed. Overall I liked the place. I stayed 3 nights with my girlfriend and we were happy with our stay. Close to the beach, about 2 blocks away. Front desk people will try and sell you tours - definitely ignore this. They speak decent English, not great. They will provide beach towels, just ask. Great shower. Solid breakfast. Clean. We had to push two single beds together; this is common in Brazil so call ahead before if you want to special request one bed for two people.